Two masked raiders fled from the furious little pet as they tried to raid a store in California. TWO ARMED ROBBERS have learned the hard way to beware of the dog – after being chased out of a California shop by a chihuahua. 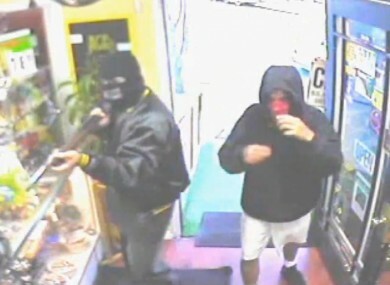 The masked raiders barged into Ace Smoke Shop in Altadena on July 7, one pointing a rifle at an employee and shouting “Give me your money.” But they soon felt the full force of little Paco’s rage. The courageous chihuahua leapt out barking worrying at their legs – and even staring down the barrel of the gun – before chasing the pair out down the road. Email “Watch: Paco the chihuahua puts paid to armed robbery”. Feedback on “Watch: Paco the chihuahua puts paid to armed robbery”.